program: multiple residential – flexible occupation. 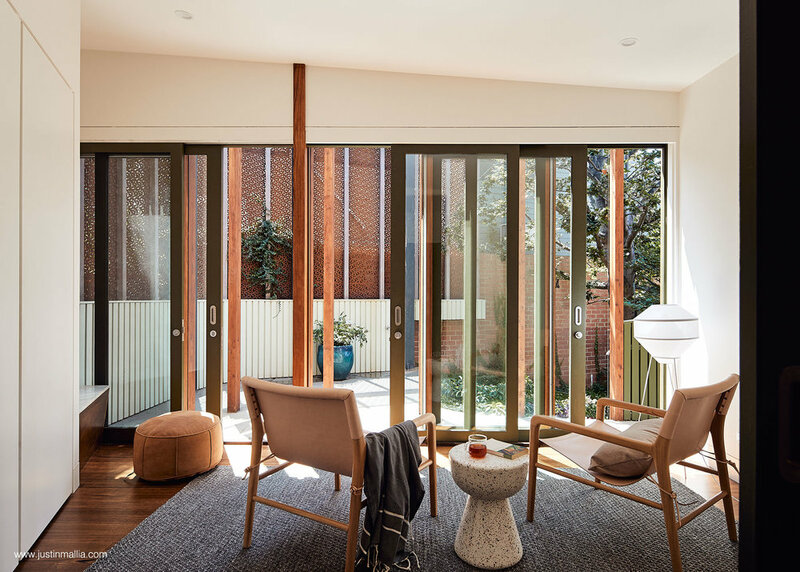 Scarborough and Welkin is a small, multiple residential project that builds upon an existing house with a previously sunny garden that had become overshadowed by a neighbouring house extension. 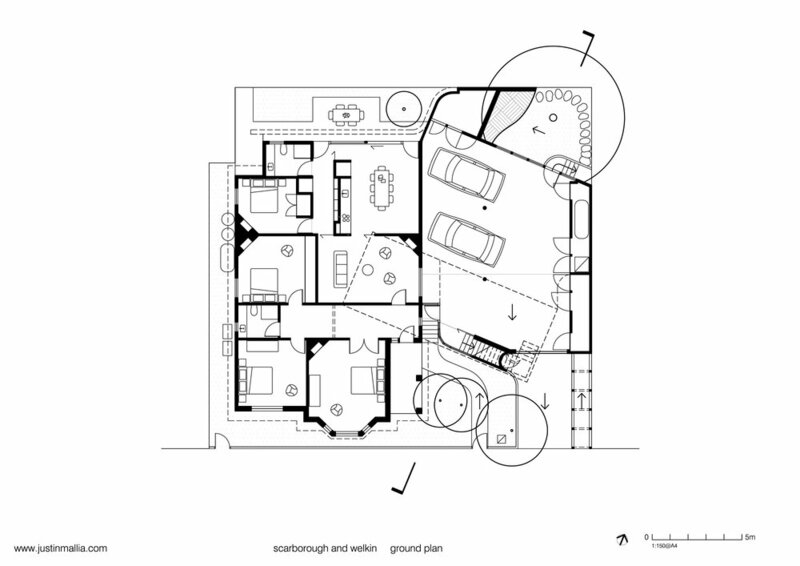 The initial project brief; to (reluctantly) replace the compromised garden with a conventional townhouse, was reimagined through sun-modelling to instead selectively nestle interconnected new building elements throughout the entire site. In detailed consideration of the nuances of the immediate surroundings, interior and exterior spaces were positioned back into the sun, trees from the original garden were retained, the natural topography sculpted and seamlessly woven into deep soil embankment roof gardens and bluestone paved terraces. 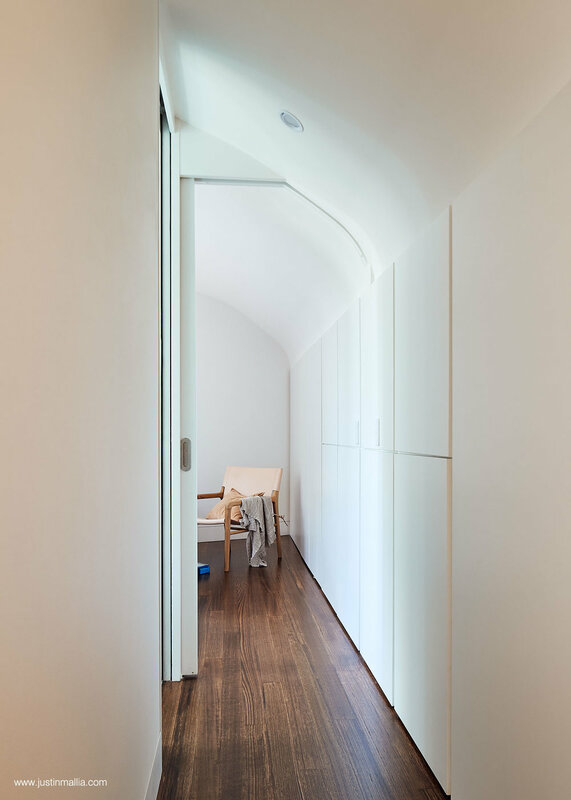 Essentially two houses, the functional brief was reinterpreted enabling multiple configurations of occupancy. Carefully crafted, hidden operable wall panels and a secret hinged bookshelf flexibly divide spaces creating a sense of identity, permanence and privacy in all configurations. 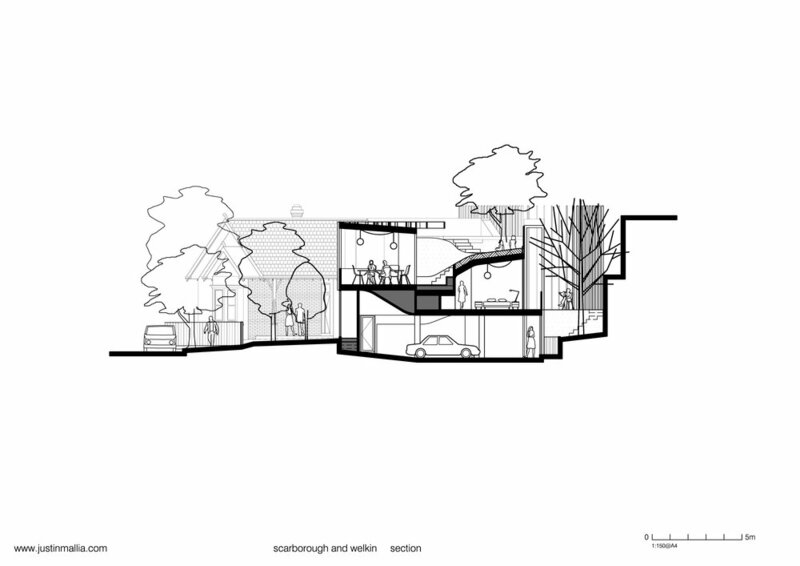 A complex circulation network including a ramped arbour walkway, paths, stepping stones, stairs, sloping floors and garden embankments, naturally enable separate entry and movement throughout the building regardless of how it is occupied. Multiple half-levels, angled intersections and curved transitions in plan and section, result in unusual internal and external volumes of space that are braided together and integrally connected. The building mass is permeated with cracks and fissures allowing natural ventilation and filtered northern sunlight to penetrate throughout a vastly varying arrangement of spaces that are a delight and surprise to encounter. 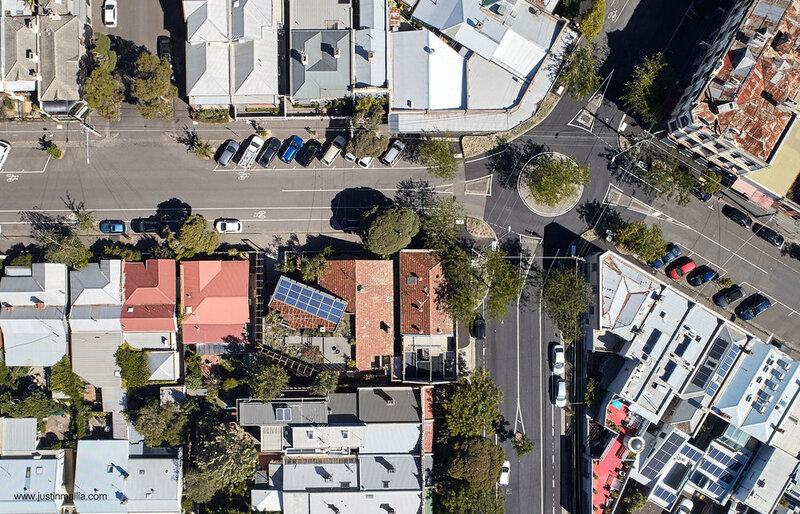 Within a significant heritage neighbourhood located at an angular intersection of streets in an inner-city suburb of Melbourne, the primary urban gesture of the design is the placement of a raised rectangular block of building form facing directly north creating an angled relationship to the street. 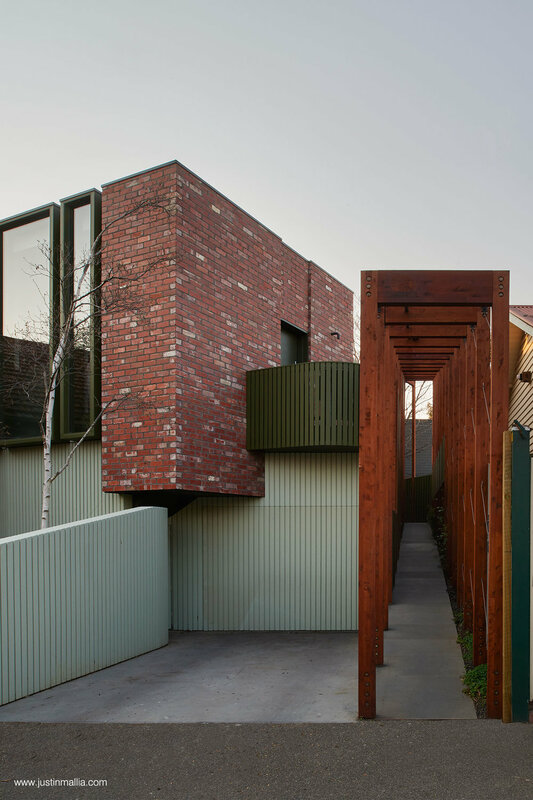 This withdraws the new building’s presence in its own streetscape and sets up a dialogue with the different visible façade orientations of the surrounding context. It creates a generous relationship to the old house, maintaining the front garden, existing trees, and the dignity of the ornate front porch and roofs. 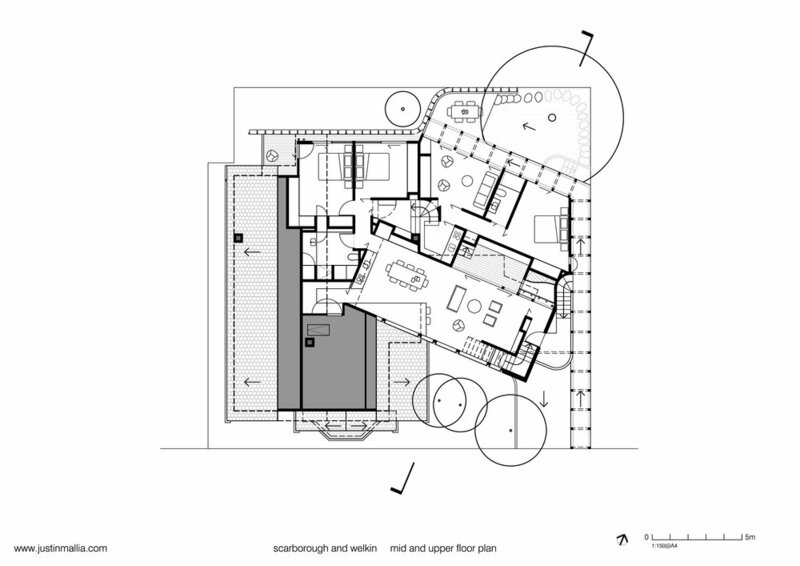 Forms and compositions are inventive but direct responses to the materiality and experiential qualities of the old house. Like the effect of the old bay window, the new angular glass, while allowing some transparent engagement, reveals subtle reflections of the trees, the ornate features of the old house and glimpses of the broader context. 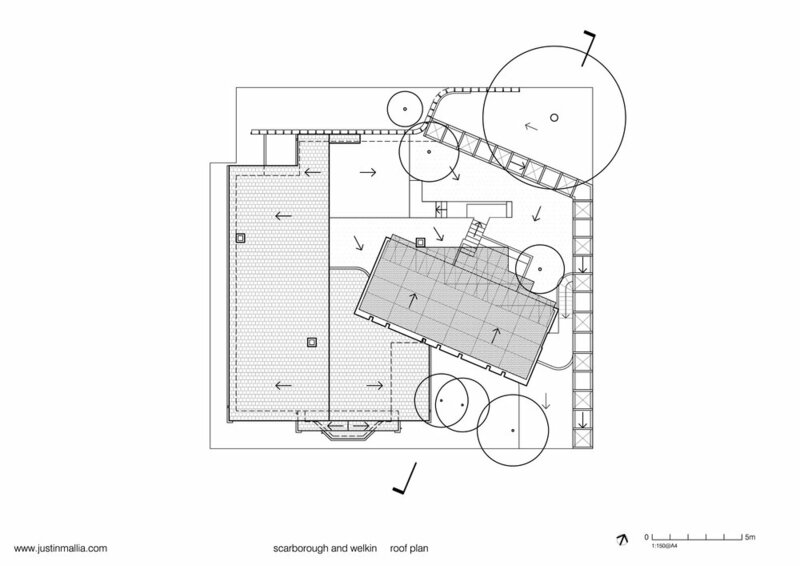 The timber and steel structure of the ramped arbour walkway are exposed throughout all levels inside and out, creating an identifiable new entry and a rhythmic organising gesture to link and contain the conceptual components. 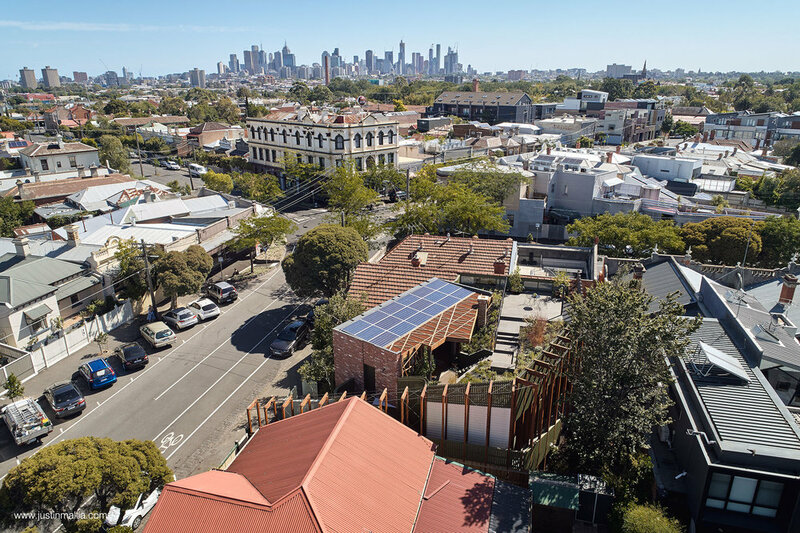 The arbour meets a serpentine, filigree rusted steel veil that wraps between spaces screening the view of the neighbouring large extension while creating privacy and sunshading. 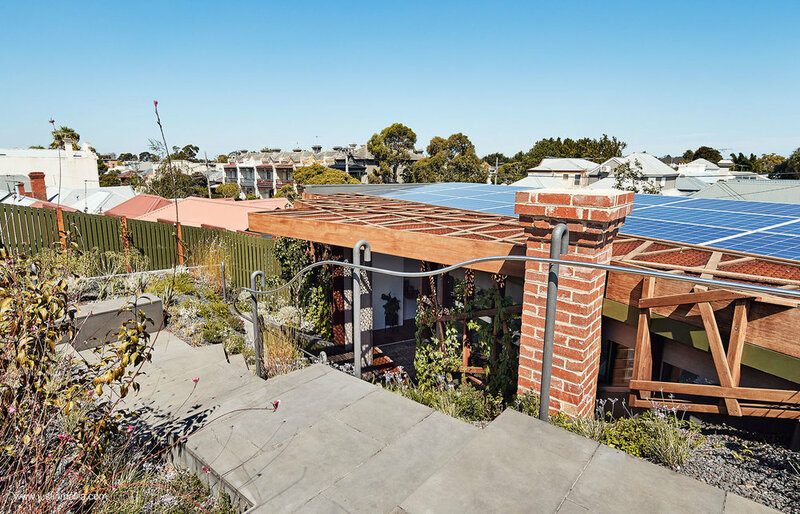 The project integrates solar panels, battery storage, heat pump hot water, filtered rainwater reuse and a multi-purpose space with electric vehicle charging facilities. 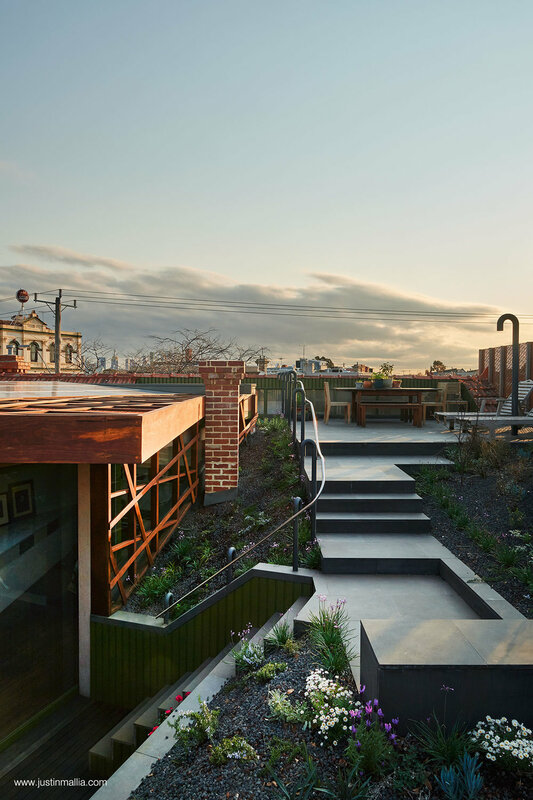 It creatively reinvents a flexible approach to modern housing, infilling a compromised gap in the urban fabric and achieving a balance that is bold and innovative while engaging respectfully and modestly with its surroundings.